AMMONNEWS - Iraqi Prime Minister Adel Abdul Mahdi and his Jordanian counterpart, Omar al-Razza, signed 14 economic agreements Feb. 2 between the two countries, during their meetings on the Iraqi-Jordan border, where a joint industrial city will be established. The agreements include the transport, trade, health, agriculture, finance and energy sectors. As with most other issues in Iraq, these agreements divided Iraqi political camps into two. One was welcoming, and the other denounced the agreements as having no economic feasibility for Iraq — especially those related to extending a pipeline from Iraq’s oil-rich government of Basra to Aqaba. The leader of the National Coalition, former Iraqi Prime Minister Ayad Allawi, described the agreements as “good” — he was supported by a group of Sunni politicians who also praised them. The Iraqi objection to the agreement is based on the fact that it came at a time when Jordan is suffering from financial indebtedness and a high unemployment rate at 18%, in addition to the large public objection to some of the tax laws there. 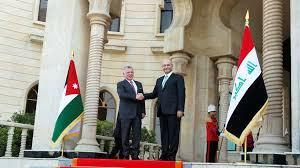 Therefore, some parliament members believe that the agreement would save Jordan and not benefit Iraq. According to the agreement on the transport sector, Jordan will exempt Iraqi goods imported through the port of Aqaba by 75% of the fees that are charged there. In the energy sector, Iraq will supply Jordan with 10,000 barrels of oil per day from the fields of Kirkuk at discounted transport costs. In the trade sector, Iraq exempted 371 Jordanian goods from customs duties. In return, Jordan gave priority to Iraqi goods entering its territory at a time when Jordan’s production of such goods is limited. With these agreements, Iraq has opened a new channel to export its oil, but at the same time, it's selling it at a price lower than the world price, further fueling the competition of the imported goods against the local ones. Some owners of factories and plants in Iraq believe that this is a blow to the country’s interests. “The attack on the Iraqi-Jordanian agreements is understandable if we look at the situation from a political point of view. But eventually, these deals are beneficial for both countries,” Yusuf Ibrahim, a Jordanian researcher in Iraqi affairs working for the Friedrich Ebert Foundation, told Al-Monitor. “These agreements are strategic, especially from the geopolitical point of view, in terms of good relations between the two countries. The agreements also give economic solutions to Iraq to sell its oil, especially in light of the US-Iranian conflict in Baghdad,” he added. The agreements the government signed will face objection in parliament as many blocs, including the Fatah and Sairoon alliances, are likely to veto them, which means they won’t be passed easily.